Mille-feuille, called "Napoleon" in the U.S., is a very popular French dessert. 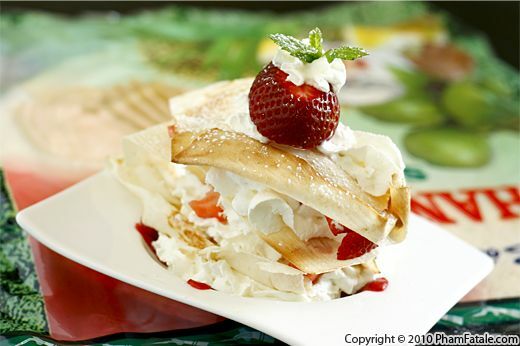 Traditionally [according to Wikipedia], a mille-feuille is made up of three layers of puff pastry, alternating with two layers of cream pâtissière, but sometimes whipped cream or jam. The top is usually glazed with icing or fondant in alternating white (icing) and brown (chocolate) strips, and combed. I’ve made traditional mille-feuilles many times before, and I was in the mood for a change. I assembled a gluten-free version using layers of Vietnamese coconut paper called bánh phông sữa. They are paper-thin sheets made of coconut milk, sugar, cassava and condensed milk. I flavored the dessert with fresh strawberries and a coulis de fraise, which is a strawberry sauce. This dessert is bake-free and so easy to create, that I had the girls do the assembly. They had so much fun putting them together and even more making them disappear!